Pausing a Campaign stops all data collection (rankings, site crawls, link tracking, reports, etc.). Paused Campaigns do not count towards account usage (keyword credits, crawl credits, etc. ), and can be activated again at a later date. Since deleting a Campaign permanently deletes all data associated with the Campaign, pausing a Campaign instead of deleting it can better option in many cases -- especially if you think you may need the data again someday. To pause a Campaign, first navigate to the Campaigns page in the Settings menu in the upper-right part of the screen. On the Campaigns screen, you can look at the Status column to check which campaigns are active and paused. 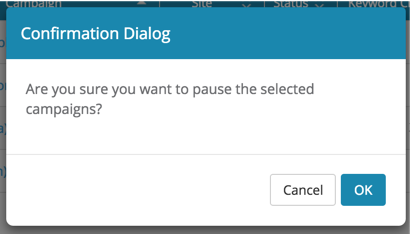 To pause a campaign, select the Campaign(s) you'd like to pause by checking the box for the appropriate row and click the Pause icon above the table. The Campaigns are now paused. 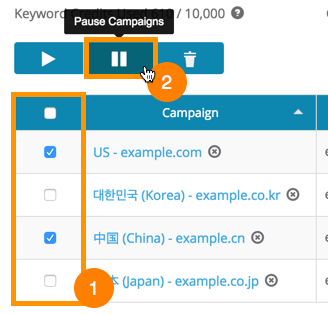 Read this article on how to re-activated your paused campaign.